Microbial Discovery Group is a Bacillus fermentation company focused on the commercialization of microbials for wastewater, bioremediation, aquaculture, consumer and institutional markets while additionally partnering with customers to fulfill their custom fermentation needs. MDG refines and delivers products and ideas by applying Real Science to a Trusted Process, yielding Proven Success. 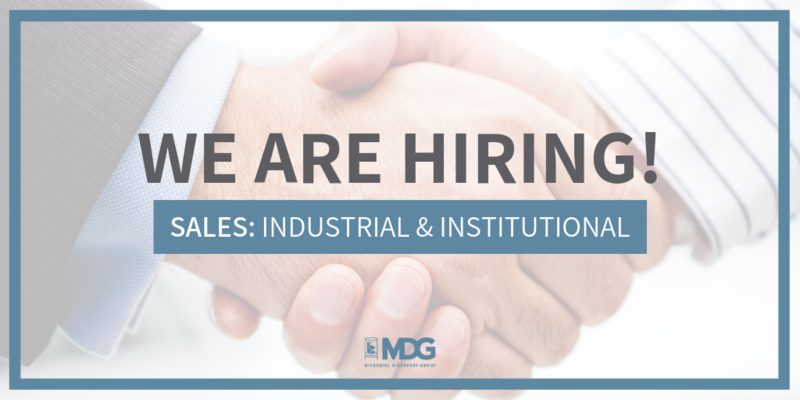 Position Summary: Microbial Discovery Group (MDG) in Franklin, WI seeks a self-driven, goal oriented industrial and institutional cleaning/janitorial and sanitation regional sales professional. Position available in various U.S. regions. National sales representatives will also be considered. In order to be considered for any position at MDG, we ask that you complete a Culture Index Survey. This survey helps with the process of finding great people who are a mutual fit. Please note that those that do not complete the culture index will not be considered.